Gone are the days, washing the clothes with hands but still folding the laundry is very tiresome. 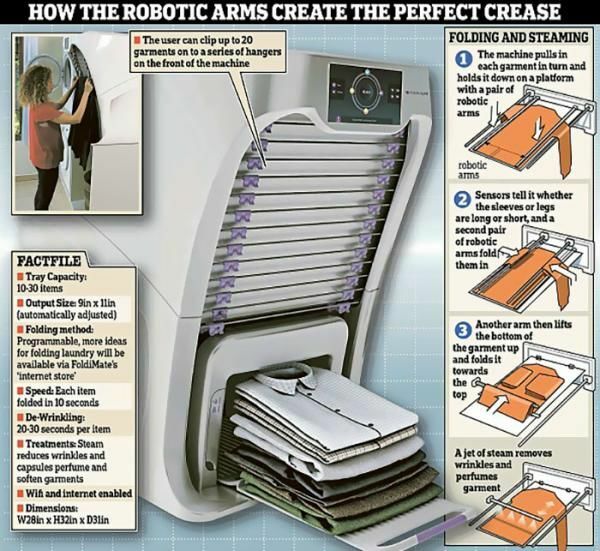 Thanks to the Foldimate, Which is a £600 laundry robot that will fold your clothes in seconds. Each cloth is perfumed, softened, wrinkles removed and treated while being folded. This three foot high robot has rows of trays where the crumpled cloths can be clipped. A maximum of 20 garments can be clipped on to the hangers on the front of the machine. The machine pulls in each garment and holds it down on a platform with a pair of robotic arms. Sensors sense the length of the garment and automatically folds within 10 seconds. Just clip your garment to the integrated rack, tell it what sort of clothing it is and FoldiMate will do the rest. It’ll retail between $700 and $850 . More ideas for folding laundry will be available via FoldiMate’s “internet Store”. A jet of steam is released that reduces wrinkles and capsules perfume and softens garments. At the end of the process, they are ejected from the machine in a neat pile.